Pleasure and fishing boats for rent in southwest Vermont at boat dealers, rental centers, outdoor stores, marinas and boat rental agent locations offering a wide variety of watercraft for rent. Find pontoon boats, fishing boats, jet skis, family boats, canoes, kayaks and other personal watercraft. 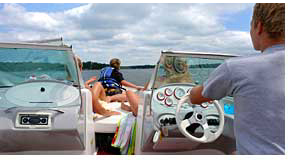 Many rental locations offer deck, ski and speed boats as well. Check below to find boat rentals in southern and western Vermont. Southwest VT boat rental options. Listed below find boat rental dealers and other resources offering boats for rent for use on Lake Bomoseen, Lake Dunmore, Lake St Catherine, Silver Lake, Somerset Reservoir, Mettawee River, Otter Creek and other waterways in Vermont. Rental locations are listed nearby cities and attractions. Cities listed include Fair Haven, Rutland, Wells, Bennington and Brandon. Contact these boat rental agents to see if they have the ideal boat to rent. Find boat rental dealers and other boat rental locations within or nearby cities, lakes and attractions in western and southern Vermont. If you are looking for a specific type boat for rent, chances are one of these dealers can assist you. Boats offered for rent typically include canoes, jet skis, family boats, pontoon boats, fishing boats, inflatables, jon boats, ski boats, aluminum boats, electric boats, jet skis and others. Some boats offered are confined to specific lakes while others are available for travel to other bodies of water. To improve your boat renting experience, click here to locate resources for safety equipment, water sport toys and boating accessories in southwest Vermont. Some marinas offer boat rentals for use on the lake where the marina resides. Check with Lake Bomoseen Marina, West River Marina or Woodard Marine for information on local boat rental options. Find a boat to rent and take the family and friends out on the water for a day of making memories. Before boating, become familiar with local boating laws and regulations. Many waterways are marked with hazard buoys - be certain you know the meaning of these various buoys.